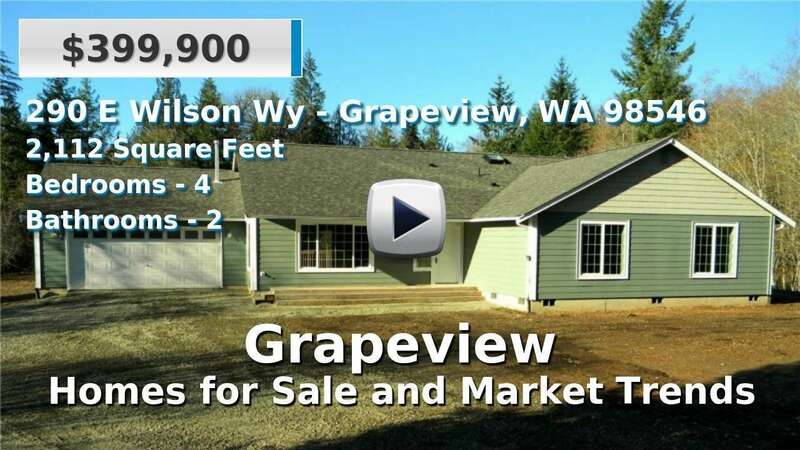 Grapeview is part of the Allyn-Grapeview community on the southern end of the Kitsap Peninsula. Grapeview sits on the Case Inlet of the Puget Sound in northern Mason County and has a population of about 1,000. Like its neighbor, Allyn, homes are newer than average and the community is centrally located between the larger cities of Shelton and Bremerton. Bremerton is home to the Naval Base Kitsap-Bremerton. Waterfront sightseeing, fishing, boating, vineyards, and an enthusiastic arts community keep residents and visitors busy. 4 Beds | 3.25 Baths | 3918 sq. Ft.
4 Beds | 2.75 Baths | 1782 sq. Ft.
1 Beds | 1 Baths | 408 sq. Ft.
3 Beds | 2.5 Baths | 2513 sq. Ft.
2 Beds | 1.75 Baths | 2504 sq. Ft.